In pursuance of Ministry of Human Resource Development, Government of India, Notification, the 6th Joint Entrance Examination (Main) – 2018 will be conducted on 08/04/2018 (Sunday) by the JEE Apex Board for admission to Undergraduate Engineering Programmes in NITs, IIITs and other Centrally Funded Technical Institutions etc. The States of Madhya Pradesh, Haryana, Uttrakhand, Nagaland & Odisha have joined JEE (Main) system. 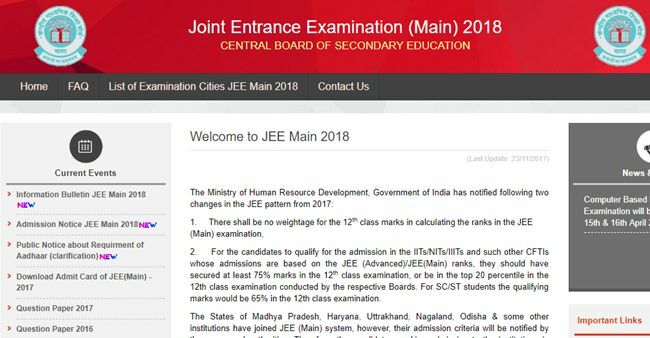 Therefore, the candidates seeking admission to the institutions in these states, which were earlier admitting based on their State level examination, are also advised to fill in the JEE (Main) – 2018 application form online.